At the end of October, the California State Auditor released a report finding that the state’s Department of Health Care Services is responsible for $4 billion in questionable Medi-Cal payments made between 2014 and 2017. The error resulted from a failure to ensure proper eligibility for the program. 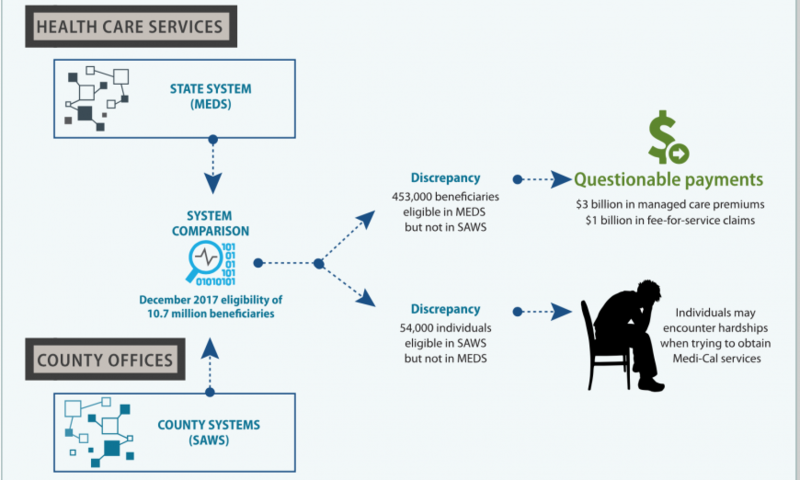 After comparing Medi-Cal beneficiary eligibility data between state and county systems, “pervasive discrepancies” were discovered. California participates in the federal Medicaid program through the state-run Medi-Cal program, which facilitates medical treatment for low-income individuals, families, seniors and disabled persons. Due to the passage of the federal Patient Protection and Affordable Care Act, as well as transition of children who had been covered under the Healthy Families Program to Medi-Cal in 2013, the number of Medi-Cal beneficiaries rapidly increased between 2013 and 2016 before leveling off. The number of beneficiaries increased from 8.6 million in December of 2013 to 13.3 million by the end of 2017, representing a 55 percent increase. Nearly one-third of California residents and 50 percent of youth receive Medi-Cal benefits. According to Santa Clara County data from July 2018, there are 375,996 Medi-Cal beneficiaries in the county. In the City of Santa Clara there are 16,874, representing 4.5 percent. San Jose has the largest proportion of individuals receiving Medi-Cal at 66.5 percent. The error on the part of Health Care Services caused more than just a large sum of questionable payments. According to the report, more than 54,000 individuals were denied eligibility for Medi-Cal in the state’s system even though they were eligible through county systems. 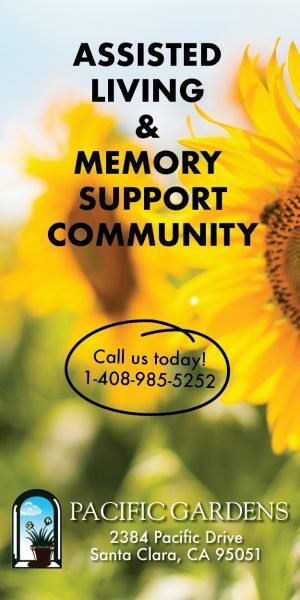 This may have caused hardships for individuals seeking healthcare as providers determine eligibility status based on Health Care Service records as opposed to county records. Health Care Services is the main agency responsible for administering the Medi-Cal program, however each county in the state administers the program in its jurisdiction. The county-level administration includes processing applications and determining eligibility. 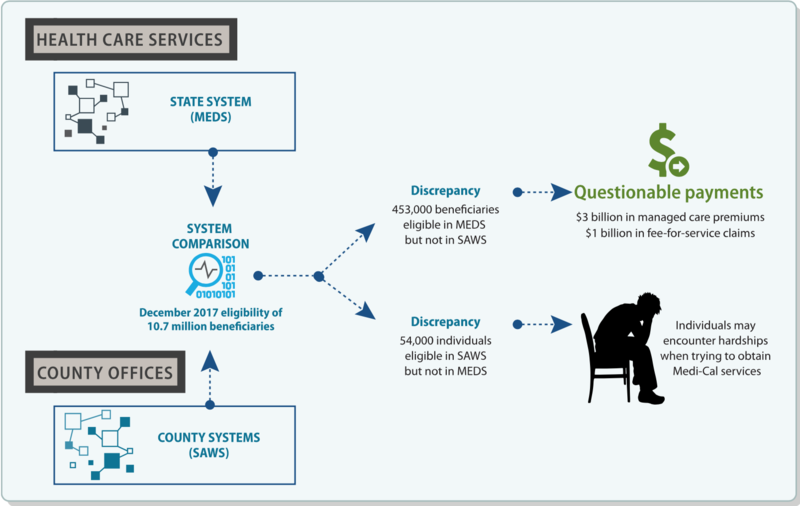 Eligibility determination for certain circumstances is also a function of Health Care Services, which also oversees the county-level process and provides $2.3 billion in administrative funding throughout the state’s counties. The California State Auditor considers Health Care Services to be a “high risk agency” because it hasn’t addressed the issues with MEDS and because the discrepancy issues have continued. Many discrepancies have persisted for years. For example, Health Care Services paid more than $383,000 in erroneous payments for a deceased person between 2014 and 2018. There was also discussion in the report about health care seekers being inappropriately denied Medi-Cal benefits because of the incompatibility between records in SAWS versus MEDS. The auditor recommended that Health Care Services implement procedures to more quickly and effectively resolve discrepancies and come up with procedures to sanction counties that aren’t correcting errors. Recommendations were also made to update to a more effective database as well as reevaluate the use of electronic notifications in MEDS. The five counties of Los Angeles, San Diego, Orange, Riverside and Alameda accounted for 85 percent of the $4 billion in questionable payments. In Santa Clara County there were over $41.3 million in questionable payments making up one percent of the total. The county had 3,931 beneficiaries with questionable eligibility status.